Whether mincing onions, slicing scallions or chopping chives, you can stop the crying. The Onion Goggles will keep you dry-eyed at the kitchen table. Their lenses shield the eyes from smoke and vapor; the cushy inner foam seal is filling in the gaps around your eyes. Use at the grill as well. No more crying into your onions. These funky goggles have a comfortable foam seal which protects eyes from the irritating vapors, released when onions are cut open. They are as easy to put on like a pair of glasses and have anti-fog lenses to ensure you will see clearly while you are preparing dinner. Makes a great gift too. Add them to your cooking arsenal and start slicing and dicing like a pro. For tear-free chopping, mincing, dicing, and slicing of raw onions. Also great to use when chopping, mincing, dicing or slicing leeks, scallions, and chives. Comfortable foam seal protects eyes from irritating onion vapors. 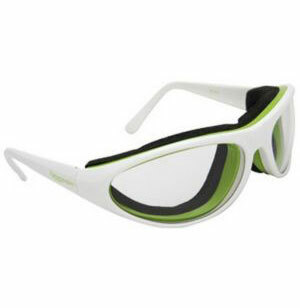 Anti-fog lenses offer maximum clarity and eye protection. Unisex design fits most face shapes but will not fit over eyeglasses. Storage case keeps goggles clean. Great for onion chopping, but also keeping smoke from your eyes while frying/barbecuing!